Rawla Narlai Heritage Resort, a cultural heritage, reflects tangible representations of tradition, systems, beliefs, and lifestyles which are the parts of human life. This cultural heritage resort contains tangible and visible traces from antiquity to recent past. Rawla Narlai Heritage Resort is one of the most famous heritage resorts in Rajasthan. It was once the attractive hunting lodge of Jodhpur Royal family. Presently, restoring tastefully and meticulously Rawla Narlai has been transformed into a luxurious heritage resort at the region of Aravalli hills. We at Rawla Narlai Heritage Resort, one of the most popular resorts near Udaipur, offer different types of facilities which will enhance your interest to make a remarkable tour in Rajasthan. Here is given information about some facilities available in our heritage resort and reasons to visit Rawla Narlai. 1. Rawla Narlai is a gateway to experience the cultural heritage of the Royal family of Rajasthan. 2. You can experience the beauty of the foothill region of Aravalli Hills which is dotted with ancient temples and caves. 3. Behind the artistic archways and gates decorated with the perfect splendour of Rajasthani culture and architecture. 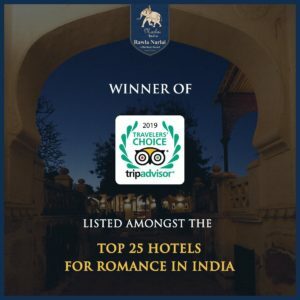 We at Rwala Narlai have the options for 25 restored rooms which are well furnished including modern facilities at the original part of the fort. The rooms are also facilitated with all kind of comfortable and luxurious arrangement to make it a perfect relaxing place in your holidays. 4. You can enjoy traditional Rajasthani cuisine including various kinds of delicacies like Gatte ki Sabzi, Laal Maas, Dal Baati Churma, Ker Sangri, Jangli murga and so on. We also offer a special dinner of Rajasthani cuisine including an amazing Rajasthani musical dance. 5. You can experience the adventurous jeep safari in the forest which is near Rawla Narlai and deer, leopards and chital may be spotted by you. a.) Kumbhalgarh Fort: It was built in the fifteenth century and is the birthplace of renowned Mewar warrior, Maharana Pratap. The fort is surrounded by a massive wall stretched about 36 km and it is the second longest wall in the world. b.) Chaturmukha Jain Temple: This temple is dedicated to Lord Adinath. c.) Sun Temple and Amba Devi Temple: Both temples are situated in the vicinity of the famous Chaturmukha Temple and dedicated for Sun God and Goddess Amba respectively. We at Rawla Narlai Heritage Resort assure you that you will enjoy the Royal culture and natural beauty visiting Rawla Narlai which is one of the best boutique hotels in Jodhpur.